Today is Spring equinox in the Northern hemisphere, and tommorow (21st) is the Spring Equinox sunrise. The Northern part of the globe has tilted towards the sun, which causes the increasing awakening of the life in this part of the world. At the same time, the opposite thing is happening in the Southern hemisphere, as today for them is Autumn equinox. At equinoxes the days and nights are of equal length, and it is also the first day of Spring or Autumn. This year there are also two other cosmic events happening at this time – solar eclipse and the moon being closest to the earth. Moon, the lunar symbol, shadowing the sun (the solar symbol) and blocking it from casting its light, as well as moon being closest to the earth (lunar influence having the strongest grip on humanity?) are certainly two interesting events that precede the sunrise of the Spring equinox (21st of March). This reminds me of the famous saying that the night is darkest just before the dawn, and the fact that this year it happens right before the Equinox sunrise (the symbol of resurrection) is certainly interesting. On the esoteric level (as already mentioned), spring equinox symbolizes the inner awakening, or resurrection, enacted by spiritual figures of the past, such as Jesus, Quetzcoatl, Krishna, and others. How does this relates to the spiritual work of the aspirants to awaken? It is said that the seasons are not only manifesting outside of us, but also in our interior. The awakening of nature at Spring equinox can influence all beings to be more active. We can of course use this to improve the work on ourselves, to be more active, to try and improve our spiritual practices, to attain more mystical experiences and therefore to get the motivation that we need so much in order to keep working and progressing. It’s also useful to reflect on the part of life of a spiritual figure related to this time of the year. A story that is probably most well known and the most strongly recounted is the one of Jesus. 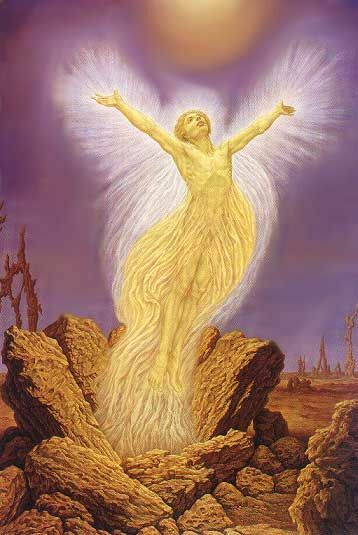 At the time of Spring Equinox his life events were reaching its peak, conveying deep symbolism as he went and enacted the Cosmic Drama of the spiritual awakening. It starts with his entrance to Jerusalem on a donkey, the crowd joyfully greeting him with the olive tree branches, then the last supper, the betrayal, the events at the garden of Gethsemane, his trial, torture, the crowd that cheered at his entrance to Jesusalem now angrily screams against him, the events happening at his crucifixion, the three days of silence, the resurrection, and other symbolic events in between. It’s a powerful story, and meditating upon it, especially at this time of the year, may provide you with an insight or maybe even a powerful mystical experience. According to esoteric teachings, Jesus publicly revealed what a person goes through in order to reach enlightenment, and that everything he went through in the physical world an initiate is going through in the inner worlds and to some extent in the physical world as well. It’s an advance stage of the spiritual work known as the Second Mountain, where initiate incarnates in him or herself the three primary forces of Creation (Father, Mother, Sun). The Work is completed by an event known as ascension, at the end of the Third Mountain, symbolised by the Summer solstice. Let’s make use of the time we have, of the opportunities that this time of the year and awakening of nature is providing us with. I wish everyone a lot of strength and guidance, and to continue aiming for the highest. The Spring equinox was very interesting. I was preparing myself for it by chanting some mantras the day prior, and I felt some interesting spiritual energy. This energy continued to be present during the dawn of the equinox itself. I did mantra Mahamrityunjaya, which is said to be a very ancient mantra, from the oldest Hindu scripture known as the Rig Veda. It was very special to chant this mantra at the dawn of the Equinox. After that I was intending to grasp the spiritual significance of this cosmic event on a deeper level through meditation, however as I had to go to work that morning and I still had to do a related thing prior to it, my mediation was ruined by worrying that I won’t make it on time to prepare myself for work. Nevertheless, I’m glad I was present at dawn and was trying to grasp the meaning of it through mantra.